ASSEMBLIES COME COMPLETE WITH 1st FILTER, BACKPRESSURE ALARM, AND MOUNTING BRACKET. Exhaust gas purification is an ever evolving technology and Agriemach are continually improving their range of exhaust gas purification systems in order to offer the most advanced, long lasting and reliable solutions. After many years of research and development into improving exhaust emissions, Agriemach now presents this innovative exhaust gas filtration system. The UGET 3 + is a dry particulate filter system, capable of reducing particulate matter by over 99%. The environmental and health advantages are clear, enabling customers to meet the very stringent regulations laid down by Government Health and Safety executives. The UGET 3 + filter housing is made of stainless steel and encompasses a heat shield for protection against burns; the filter cartridge is fire & heat resistant (to 200°C) and also resistant to aggressive elements contained in the exhaust gases. The texture weave of the special fibres retains carbon particles as small as 20nm.The filter system is fitted in addition to the existing exhaust system and the fibrous material of the filter element traps the carbon particles, retaining them in the filter allowing the remaining exhaust gases to pass through. UGET 3 + filters are available in various standard sizes and are supplied complete with cartridge(s) ready for immediate use. As well as standard models shown here, Agriemach can produce units suitable for even larger engines to suit customers’ individual needs. Agriemach recommend that the UGET 3 + filter is fitted as far away as possible from the engine to avoid any problems with the filter overheating. The filter housing should be fitted to the vehicles frame or body with fixing brackets and connected with a piece of flexible pipe, using the counter flanges supplied, to the existing exhaust outlet. It is advised to fit the UGET 3 + filter system after the silencer. Fitting the pressure control kit is straight forward and is Compulsory in some European countries. In order to check the efficiency of the system, an additional control system is available separately to verify the backpressure created by the filter. Through a LED, the pressure control kit shows the operator the filter is working correctly or if any necessary maintenance is required. Also available is the ECU BYBOX, an advanced control system to monitor temperature and pressure, storing the related data values for evaluation later. The filter does not require any scheduled maintenance. At the end of the filter cartridge life, the back plate and cartridge are removed and replaced with a new one. Used cartridges are not classed as hazardous waste, but must be disposed of as special waste. 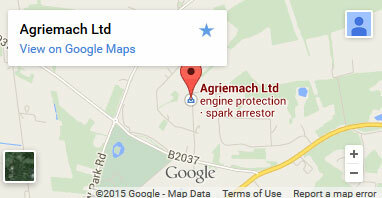 Agriemach suggest verifying local regulations for the disposal of used cartridges. The life of the filter element is approximately 250 hours of use, depending on the condition and maintenance of the engine.